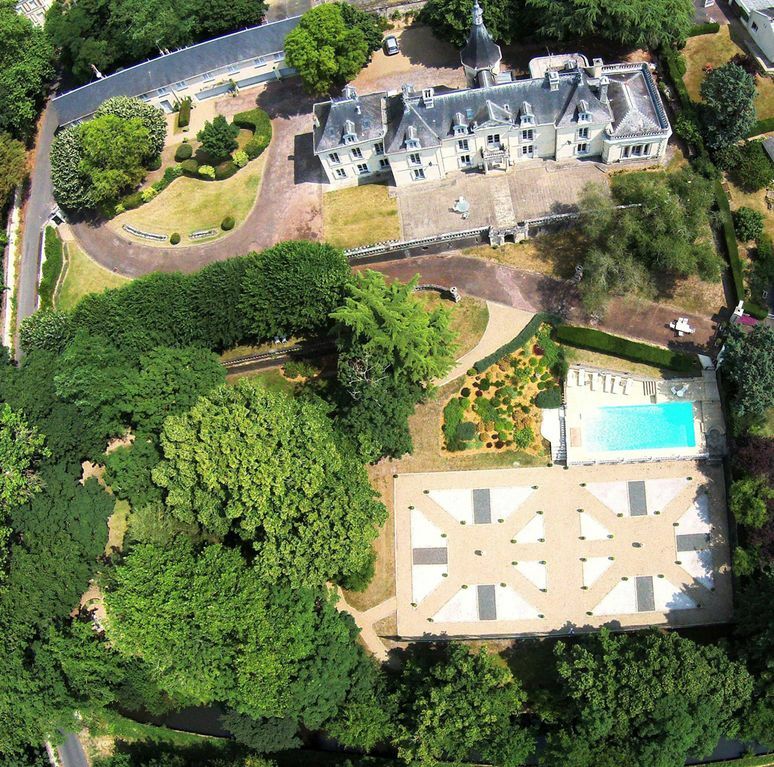 Château des Sablons is a beautiful 18th century chateau with a white stone facade. It is ideally situated on the edge of the medieval market town Bourgueil which is amidst some the greatest castles in the heart of the Loire Valley. The Bellevue Suite is a delightful one-bedroom suite located on the ground floor of the Château des Sablons. From its premier étage location (American second floor), it overlooks the gardens and park of the chateau with plenty of greenery and sounds of birds in the morning. Guests in the Grandview Suite are able to enjoy the swimming pool and grounds of the chateau. The grounds are designed to provide an enclave of peace and quiet and guests are encouraged to use the various tables and chairs in the park seating areas for coffee, drinks and meals. The chateau makes a great place to relax after a day of sightseeing or even in place of a day of sightseeing. Sightseeing By Foot: You can choose to visit the area by foot, bicycle, train, or auto. The Chateau des Sablons is only a 15 minute stroll from the center of Bourgueil. The town is well endowed with shops, including three butcher shops, five bakeries, three café-bars, five restaurants, a wonderful patisserie and a good news agent’s shop for newspapers, etc. In addition there are two supermarkets, one in town that stays open Sunday morning and one just on the outskirts, the huge HyperU Supermarket. The town is prosperous and enjoyable, and a center of wine production. The A.O.C. of Bourgueil is present on every wine list of any size in France and visiting the neighboring wineries (you’ll pass vines on the way into town) is one of our guest’s favorite activities. There are plenty of guides for visiting the region by bicycle, but the immediate area has three bike circuits of about 40 km that provides visitors with a unique visit to the area. One focuses on the vineyards and wine-producing areas, another on the old ports on the Loire, and another takes you up into the hills and along the Chaungeon to see the mills, etc. You can also combine bicycle tours with the train to extend your range. Almost all local trains from the Port Boulet station 3.5 km from the chateau carry bicycles. This allows you to ride to Saumur on the bike and then take the train home, for instance. Sightseeing By Auto: The Chateau has a very convenient location, being only 3.5 km from an exit from the A85 motorway. This allows you immediate access to the motorway and speeds you to some of the further distance chateaus such as Amboise (less than an hour), Chenonceau (45 minutes), Langeais (15 minutes), Villandry (20 minutes), Chinon (15 minutes), Saumur (25 minutes), Montosreau (15 minutes), Angers, Azay le Rideau…. Apple TV on demand entertainment system that includes access to an extensive library of over 500 English language movies and TV shows, and access to international news pod-casts. Details: * Located on the second floor of the Chateau des Sablons * Beautiful, authentic furnishings * Comfortable living/dining room * Kitchen with gas cooker, fridge, oven, coffee pot, and dishwasher * A bathroom with shower and toilet Services include: * Linens and towels * Iron and Ironing board * Parking available * WiFi Internet Access * Apple TV on demand entertainment system that includes access to an extensive library of over 500 English language movies and TV shows, and access to international news podcasts. This suite accommodates up to two guests, and allow for the perfect vacation no matter your pleasures. Activities also abound in the area. Visit other chateaus, tour museums, and taste the area's fine wines and cuisine. Enjoy numerous outdoor activities that include: water sports on the lakes and rivers (swimming, windsurfing, water skiing, canoeing, and sailing), hunting, fishing, golf, and walking or cycling in the beautiful countryside and forests. Please contact owner for additional info, photos, and testimonials. Ask us about special rates for add-on nights! If your visit bridges two rates periods your rate will be prorated between the different rates. Please note that the above rates are the minimal rates per period shown. Rates are based on up to 2 guests, and, until confirmed, are subject to change without notice. Please note that there is a charge of 10 Euros per person per week for towel service.